Roller coasters, pirate ships, ice creams and popcorn – put all these things together and you’re almost certainly in the middle of a fairground or perhaps even a theme park. It’s a place for thrill seekers and that’s also the name of this Playtech slot which assails your senses with noise and colour. Fifty paylines are available on this five reel online slot set against a background of a huge roller coaster and a purple and blue big top. There are loads of theme park-related symbols here and from low to high value we have sticks of rock, a soft drink, ice cream, candy floss, popcorn, the pirate ship ride, a ghost train and the roller coaster. The special symbols are represented by a bonus hammer, a ticket scatter and a an appropriate clown wild symbol. The first bonus game is triggered by landing three or more scatter symbols anywhere on the reels during standard gameplay; you’ll win ten free spins with all prizes doubled during this phase and as an extra bonus it’s possible to trigger more fee spins by landing more scatter symbols. You will already have noticed the hammer bonus symbol and if you can land three, four or five of these on an active payline you will trigger the bonus game. The game is based on the famous fairground challenge where you must hit a button as hard as possible with a big mallet with the intention of sending a marker up towards a bell. The bonus game will prompt you to click the ‘Hit’ button and the marker will then strike the bell, awarding you with a cash prize. Playtech’s Dollar Ball game is part of it’s progressive jackpot network and you can activate this lottery-style competition by clicking the Dollar Ball button at the top of the screen. You can choose, or be allocated, five numbers between 1 and 49 and with each spin numbers will be drawn. Various win amounts are available but matching five will win you the current jackpot total. Playing the Dollar Ball will cost you a little extra on top of your stake. 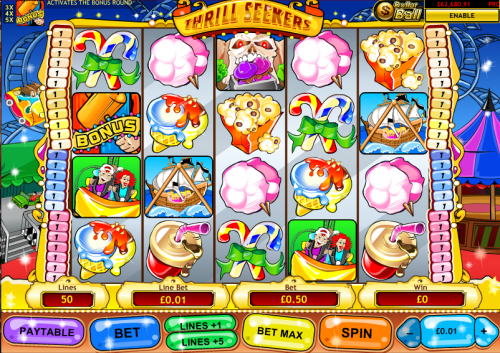 Thrill Seekers assaults your senses with a barrage of colour and sound effects; the fifty paylines mean lots of smaller, more regular wins and the two bonus games are the icing on the cake. It’s not for the faint-hearted but it is certainly enjoyable.